Water policy in Ghana – the first independent sub-Saharan African country, and one of the first to be targeted by privatization policies, has undergone a slow but radical change over the years. During the 1980s, the Rawlings regime saw external funders, especially the World Bank and the IMF, directing the restructuring of the Ghanaian economy as a condition for receiving loans. 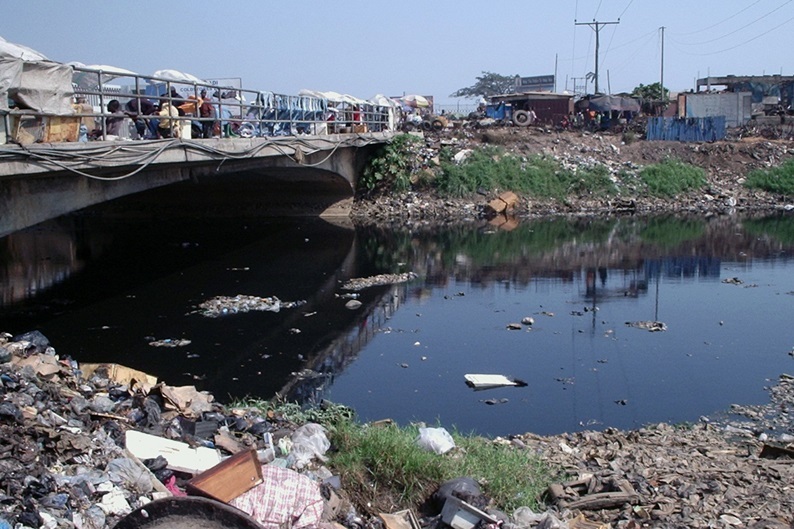 Water reforms in the 1980s included sacking staff in the publicly owned Ghana Water and Sewage Corporation (GWSC), attempts to curb non-revenue water and an emphasis on ‘cost recovery’, which later would lead to 95 percent increase in water tariffs in May 2001. By 1999, the GWSC had been replaced by the Ghana Water Company Ltd. While 100% state owned, it was not responsible for rural water services nor for sewage disposal, as these were not seen profitable enough. According to On the Commons project, "In the same year, the World Bank’s plans snarled up on the issue of national sovereignty: the government objected to the accusation of corrupt tendering practices, and the World Bank withdrew its US$100 million loan – but with an eye to elections the following year." In fact, the new New Patriotic Party government resulted to be much more in favour of the World Bank’s ‘reforms’ than Rawlings’ National Democratic Congress, and organized an international tender for the [public-private partnership] lease contract. In March 2000, the government of Ghana awarded a 30-year Build-Operate-Transfer (BOT) contract for one half of the country, including the capital Accra, to the US company Azurix, a subsidiary of Enron. The move met with the opposition of residents and national organizations. In 2001, 9 transnational corporations were shortlisted. 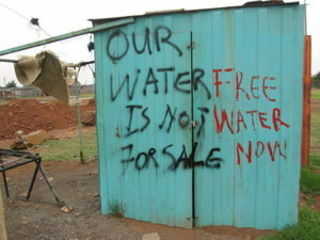 But many local residents and activists opposed these moves and founded the National Coalition Against the Privatisation of Water, which was established at an Accra forum in 2001. Members of South Africa’s Anti-Privatisation Forum and Municipal Workers’ Union participated, as well as an activist from Bolivia’s Cochabamba water struggle, to share their experiences and visions. The Government decided to start a privatization process some years later, in 2006, by creating a public-private partnership model. One year earlier, in 2005, the World Bank secured a private sector solution to the water crisis. A remarkable turnaround in Ghana’s water sector occurred in June 2011. After five years of managing Ghana’s urban water services, Aqua Vitens Rand Ltd, a Dutch South African water corporation, failed to renew its contract with the government-owned Ghana Water Company Ltd. Ghanaian opponents to water privatisation had won a resounding victory. They effectively wrong footed the World Bank, private sector advocate and major funder of Ghana’s water sector. According to the campaign, on all major contractual obligations Aqua Vitens Rand Ltd failed. Furthermore, they had got on the cheap because it required no investment on their part whatsoever; it was a management contract, not a lease contract. Aqua Vitens Rand Ltd failed to decrease non-revenue water, they failed to increase the production of water, and they failed to improve bill collection. Service delivery (not surprisingly) failed to benefit from reducing the number of workers, i.e. cutting the cost of wage bills Leonard Shang Quartey, of the organization Integrated Social Development Centre (ISODEC), the campaigning NGO which spearheads the anti-water privatisation coalition, declared in June 2011 that no forms of privatization is acceptable by the campaigners, despite all efforts from the WB. They want a strengthened and restructured Ghana Water Company Ltd, that is, a public water authority charged with the provision (as opposed to the cost recovery) of clean water. : ‘This whole idea about Ghana Urban Water Limited, I don’t think it’s necessary, We have to focus our efforts on GWCL [Ghana Water Company Ltd] and make it workable.’ On the Commons project asks: "What solutions are there?" Quartey and the coalition's response is that want increased government spending: the water sector, for example, is more than 80% donor funded. They argue that the country can finance their water sector themselves. 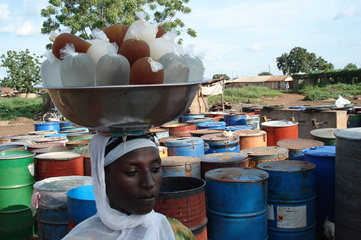 Since 2010, the country has produced oil and is now one of the world’s leading gold and cocoa producers. Taxation needs to be properly regulated. "Last year’s increase in corporate tax on mining companies was a step in the right direction, Quartey said. Project Details After the privatization the level of service was reduced and the per capita demand went from 45 to 20 litres of water per day. The supply of drinking water at national level - non-municipal areas - decreased from 46 percent of the population in 1992 to 30 percent in 1998. In 2002, the Government of Ghana estimated that around 66 percent of urban residents, and only 37 percent of rural residents, had access to drinking water. public and participated management of water resources, which can ensure a good and equal access to water, sanitation, etc. Why? Explain briefly. After a 5 year contract signed in 2006, the government decided not to extend it in 2011, saying that the private operator had not lived up to expectations, constantly failing to meet its obligations stipulated in its contract with Ghanaian government. Finally State-owned companies provide the water services again. However, it is not clear whether the intention of the Government is to make a contract with other companies.